The User Profile window displays the user's attributes, role membership and permissions. If a user is viewing his/her own profile, then some items may not be visible or may be read-only. If an administrator is viewing (or editing) the profile of a user, then all items will be visible. Such distinctions are indicated below. To open the User Profile window, click the More Options icon on the right-side of the main window frame for the selected dashboard. 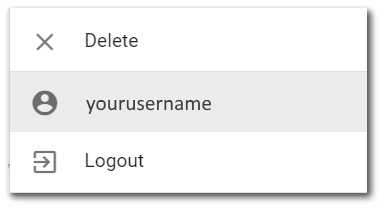 From the drop-down menu, click on your user name next to the user profile icon to open the User Information window. The top-left portion of the User Profile window contains information about the user. User Name – The user name of the user. This value is required (i.e., may not be null), must be unique in the ST_USER table, and is immutable (i.e., cannot be changed after the user is created). Professional. These special characters should be avoided. Email Address – The email address of the user. This value is required (i.e., may not be null), must be unique within the ST_USER table, and must be a valid email address. First Name – The user's first name. This value is optional. Last Name – The user's last name. This value is optional. Preferred Message Delivery Method – Used to set the message delivery method to either Web Only or Email and Web. This value is required. Click Here to Change Password Button – Used to change the user password. The bottom-left portion of the User Profile window contains the application settings for the user. 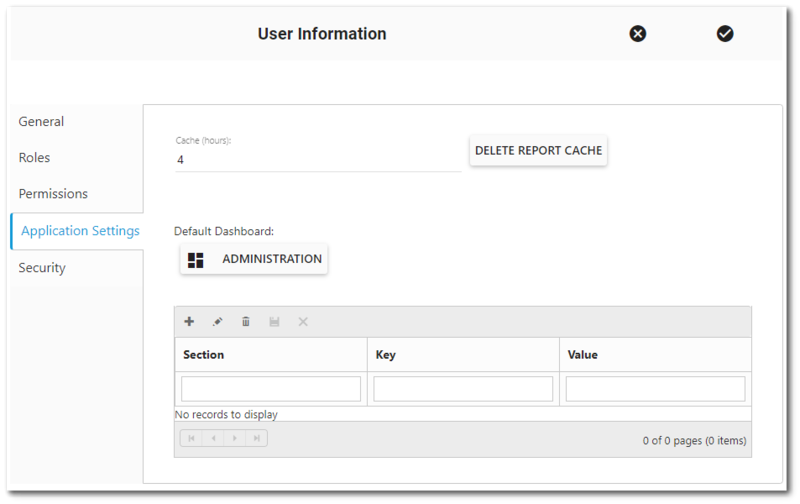 Cache (hours) – This setting pertains to the number of hours to cache report output. A zero (0) value indicates no caching. A non-zero value indicates the number of hours to cache report output. Fractional values are allowed (e.g., 0.25 = 15 minutes). See this video for more information. Remark – This is an optional field for storing a remark. Delete Cache Button – This will delete the Enterprise cache. 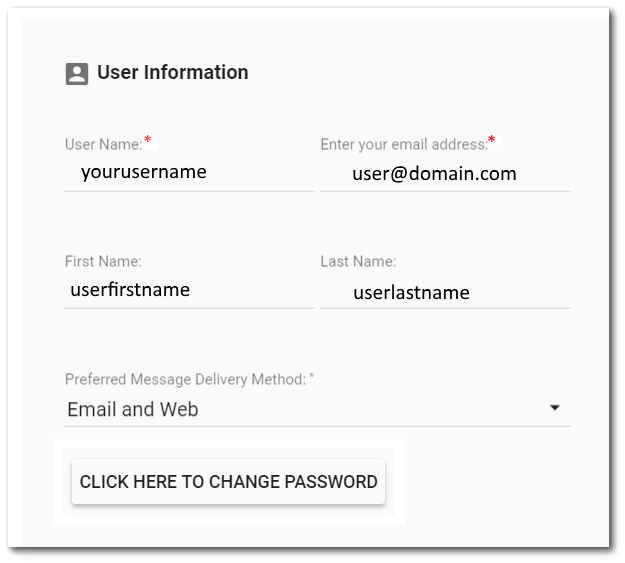 Default Dashboard – This is an optional setting that can be used to set the default dashboard to load upon user login. If a default dashboard has not been set, the current dashboard title is displayed. Clicking on the Choose Dashboard button will open the Dashboard Chooser and a default dashboard can be selected. Another example, if a user adds the following entry, the Dashboard Chooser will default to Recent. The top-right portion of the User Profile window contains a grid that displays the user's membership. Users that are not administrators will only see the roles to which he/she is a member and will not be able to change role membership. Administrators will be able to see all roles and optionally change the user's role membership. Name Search Box – Enter a search term (one or more characters) that will be used to search for roles. Only roles will be displayed that contain the search term (name, remark). Press the keyboard <ENTER> key or click the Search button (just to the right of the Search box) to search for roles. The grid columns contain attributes of the role. The columns are sortable by clicking on the column header (click again to reverse the sort). The columns are as described below. Role Icon – This column is for display purposes only and may not be changed. Name – The name of the role. This column is for display purposes only and may not be changed. User – If the icon is displayed, then the user is a member of the role. If the icon is not displayed (i.e., the cell is empty), the user is not a member of the role. •Click the column header to sort by role membership (i.e., to see roles for which the user is already a member sorted separately from roles for which the user is not already a member). •Click the cell to toggle role membership for the given user. Membership is not saved until the Save button is clicked. The bottom of the grid contains paging controls for displaying a limited number of roles at a time, as described below. Arrows – Use the left/right arrows to navigate through pages. Go to Page List – Select a specific page to navigate directly to that page. Rows per Page – Change the number of roles to be displayed per page by using the drop-down menu. Count of Pages and Total Items – This control indicates the total number of items available in the grid, how many pages to display the items, and which page is currently selected. The paging controls are specific to the current search. For example, if there are 15 roles, but only four roles match the current search term, then the paging controls will apply only to the four matching roles. The bottom-right portion of the User Profile window contains the permissions grid, where user permissions can be viewed and/or changed. The permission grid is hidden by default. If permissions need to be granted or denied to a user specifically, the permissions grid can be displayed by checking the Permissions check box. If the User Permissions Report has been enabled, a download button will be available to download the User Permissions report for the given user. Enterprise 7 introduces license-based roles. New users are created with the STATUS_FLAG set to 'R'. Assigning these users to a licensed role (e.g., EQuIS Enterprise - Gold (Live) role) activates the user and the user's STATUS_FLAG is set to 'A'. When removed from the licensed role, the user's STATUS_FLAG is set to 'R'. Roles can be assigned in the Role interface on the top-right in the User Manager widget. Note: It is strongly recommended to not alter user status or any other user information via ST_USER. When an administrator is viewing the user profile of another user, s/he will see an impersonate button with the More Options icon to the top-right of the window. Clicking on this icon will allow the administrator (after a confirmation prompt) to disable a user. Note: Only use the 'Disable' function for a user if you plan on not re-activating them. If you plan on reactivating a user, it is strongly recommended to remove them from a license role and NOT disable them. When an administrator is viewing the user profile of another user, s/he will see an impersonate button with the More Options icon to the top-right of the window. Clicking on this icon will allow the administrator (after a confirmation prompt) to impersonate that user. The browser will refresh and the administrator will now be logged in as the specified user (with all applicable permissions, etc.). A record is added to the ST_LOG table indicating the administrator's user name and the user which was impersonated. To end impersonation, the administrator must click the Logout link. Impersonation works for basic authentication (e.g., username and password) and Lightweight Directory Access Protocol (LDAP) authentication. All changes made on the User Information window will only be saved when the Save button is clicked. If the Close without Saving button is clicked, none of the changes will be saved.